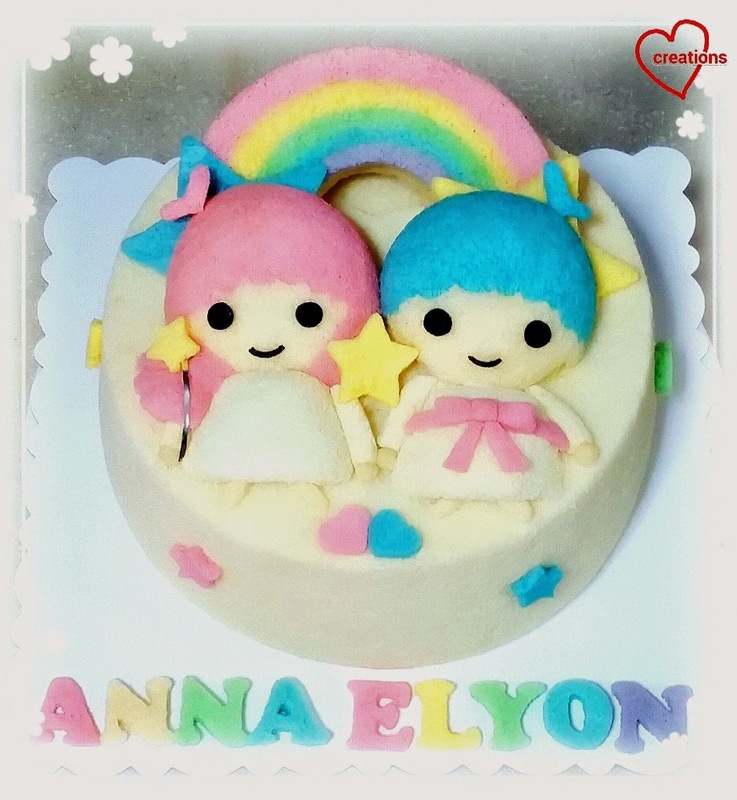 This is a Rainbow 'Little Twin Stars' Vanilla Chiffon Cake for an old friend’s lovely daughter who was turning 7! She had taught me many things when I was younger and I am so grateful for that. Anyway back to the cake, she liked my previous Little Twin Stars Rainbow Chiffon Cake but requested for more 3D chibi cute characters. So I baked the Little Twin Stars in smaller round Iwaki bowls instead of the original oval bowls (see Hatching chicks chiffon cupcakes, replace the two portions with cream and pink/blue batter instead). She also requested for a rainbow above them so instead of layering the rainbow colours like in the previous Little Twin Stars Rainbow Chiffon Cake, I piped the rainbow colours on the base of the chiffon tin and then cut the chiffon cake into two (one chiffon cake makes two big rainbows! =)). Their arms were made of tiny vanilla chiffon swissrolls and the rest of the rainbow letters/stars were cut from rainbow coloured chiffon cake baked in layer trays. So thankful she shared it was a hit and everyone loved the cake! Made me so happy hee..
Do you have this in your recipe book ?